My pal Alan has just sent me a fine account of his recent fishing trip in New Zealand. Followers of the blog will know that I was on holiday over there at the beginning of this year so I know every particle of silt (and there are plenty) in the estuary that he is writing about. In the past Alan, although he's a keen fly fisher, has not really got into saltwater fly fishing but things look set to change. Fishing yesterday was a bit of an after thought. I put my fly fishing gear in the car but was fully expecting that it would remain unused. We arrived in Whangamata at almost dead low tide so if I ventured out it would be to fish the slack water and the first stages of the incoming tide. There was a strong wind from SW, puffing steadily at 15 - 20 knots. The sky was blotted with splotches of concrete grey cloud, a threatening portent of rain. As I drove down to the estuary the car thermometer dived below 10 degrees C so, with the wind chill factor added, it promised to be a cold session. After tackling up in the car park I waddled across the estuary in my warm, waterproof layers to the marina entrance. Seven beady avian eyes plotted my progress. Four kingfishers, perched strategically on the larger rocks used in marina construction, and three shags, stationed near the marina junction, all sat side on and stared intently at the camouflage clad intruder squelching across the mud towards them. The good news is that there is less mud over winter so it is nowhere near as difficult walking in waders through the glutinous gloop as it was over summer. I started by fishing the channel across and down with the reverse smelt. No touches but casting was a joy as I was shielded from the wind. In hindsight, the lure probably was not sinking deep enough to get to where the fish were holding. After cast number six one of the shags slipped nonchalantly into the water, swam to mid channel, dived and re-emerged seconds later with a 6" flounder clasped tightly in it’s beak. It was almost as if it was making a statement. I could virtually hear it harrumphing “you fool, this is how you catch fish”. Watching it swallow its prize was an education. It took quite a while to manoeuvre the flounder into position, compounded by the fact that one of the other shags was trying to extract the flounder from its maw, and when it finally swallowed the fish the shag momentarily metamorphosed into a king cobra as the flounder moved down its neck via peristalsis. I was interrupted next by two youths who made their way noisily across the sand on the far bank to the channel edge. They started lobbing rocks into the tide oblivious to my presence so I wound in and beat a hasty retreat, moving resolutely across the sand to main channel. As the tide was about to start coming in the best option seemed to be to start fishing from main side stream upstream to where I normally commence. The wind was a nuisance as it was blowing onto my casting shoulder and altering the trajectory of the fly towards my head. 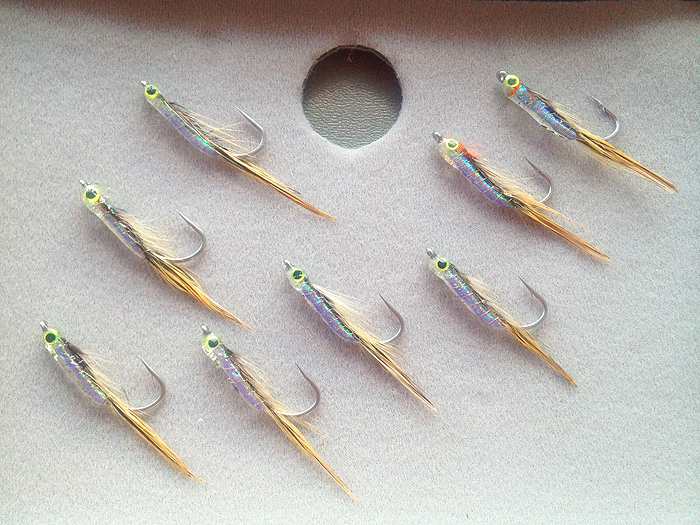 The reverse smelt fly was reasonably easy to keep on track but when I changed to the Velcro crab it got blown around like Mary Poppin’s hat and threatened to pierce my right ear as it whooshed past. Obviously the VC needs more weight in windy conditions. It also did not sink until the Velcro got waterlogged so I’ll need to fish it on a sink tip or add weight to get it down to the bottom. In desperation I switched to the ever reliable orange Clouser ribbed with red wire. By now I was casting methodically and moving two steps upstream between casts. As I neared the first permanent mooring buoy I felt resistance on the retrieve and strip struck coming up solid on a small kahawai. It put up a measure of resistance commensurate with it’s size but was no match for the 6 weight fly rod and was quickly landed and returned. Twenty minutes later, as I reached the second permanent mooring buoy the same thing happened. Two fish, albeit small, in marginal conditions so I was well pleased I’d ventured out. As always the fish hold near the buoys or under the moored boats so it is worth putting in more effort around them. Ten minutes later, as I continued my relentless march upstream, two larger fish swirled about three rod lengths away. I immediately covered the swirls but nothing was interested. “Change tactics” a voice whispered in my ear so I sent a long cast upstream much closer to the bank. The fly sank, I stripped line in three tiny bursts and the fly got absolutely monstered. I struck hard and the weight came on immediately. 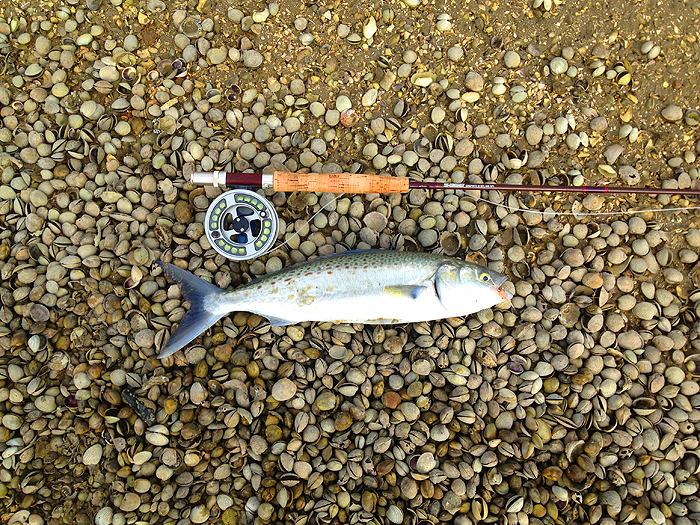 The heavy arc in the fly rod and the resistance on my forearm signalled this was a much better fish. It hit the after burners and headed into mid channel but it soon turned when side strain was applied. I picked it for a trevally as it spent the next 5 minutes running parallel to the shore and systematically changing direction every 50 metres or so. A bow was being blown into the line by the wind and there was a constant strumming coming from whatever was attached to the fly (Classic trevally behaviour, I thought). This fish was signalling that it was not going to capitulate without a struggle. Then, as if someone had flicked a switch, it started jumping. A kahawai and not a bad one. It jumped six times in the knee deep margins, shaking it’s head like a tarpon to throw the hook. Eventually it ran out of steam and finally allowed its 3 lb. bulk to be drawn onto the sand exhausted. I took a photograph and despatched it so that we could enjoy it’s company again later. Delicious pan fried in butter with lemon juice and black pepper, served with a side of crispy, steaming fries. The only green evident being a skerrick of parsley perched precariously atop the fillet. By now the tide was starting to flow steadily in and starting to isolate me on the flats so I beat a hasty retreat and headed home with my prize. The most interesting aspect of the session was that the kahawai started to move about 1 ½ hours on the incoming tide. This is the mirror image of what happens when the tide is flowing out where the 1 ½ hour period prior to low tide is often when things happen. I’ll try and get back down to Whangamata again in the next few weeks as I’m sure that the big trevally will have moved in by now as the water is very cold. Excellent stuff! I felt as though I made every cast and swore at every shag with my pal and I'm sure any angler must get a real whiff of the salt water experience by reading his description. Those kahawai must be amazing sport on fly gear and if you hook a six pounder or a decent trevally you'll need lots of backing on the reel. I can't wait for him to have another go.